Want to add an explosion of colour to your shopping experience and make other shoppers green with envy? For one day only you can buy a trolley dolly today (Wed Aug 17th) and get a 30% discount saving you over €10. Simply insert the promotion code trolley dolly on our website at checkout to avail of this great offer. The Trolley Dolly normally €34.95 is all yours for just €24.47 plus delivery! Did you know that an estimated 100,000 animals die every year by ingesting plastic bags which they mistake for food? 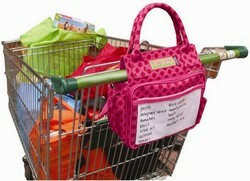 Kiss the plastic bag goodbye forever and contribute to the environment with your Trolley Dolly. So get shopping (in more ways than one) and come see the six Trolley Dolly styles and colours in this promotion by clicking here! This promotion offer and code is valid for the Trolley Dolly Only.